Open 9 a.m.-2 p.m. Saturday in Chanshtnu Muldoon Park, 1301 Muldoon Road (at DeBarr). Fresh produce from local farms and gardens, Alaska seafood, eggs and honey. 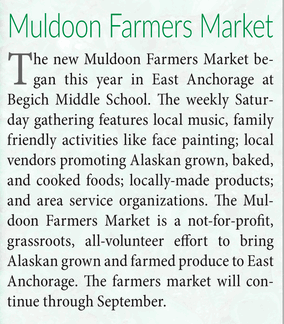 Locally cooked, baked & pickled foods, Alaska arts and crafts, live music. Family friendly. Accessible playground. EVENT PARKING: Muldoon Mall lot, just north of the park. A short, paved walkway leads directly to the market. The market will be open 9 a.m.-2 p.m. every Saturday through September 29. This entry was posted in event and tagged 2018, Alaska Grown, August, featured. Bookmark the permalink.